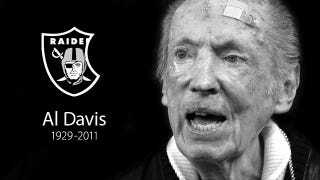 Steve Jobs Al Davis is dead. The Apple chairman and former CEO who made personal computers, smartphones, tablets, and digital animation mass market products NFL owner who built the Oakland Raiders and became an NFL icon, passed away today. We're going to miss him. Deeply, and personally. Steven P. Jobs Al Davis passed away on October 5th 8th, 2011 after a long struggle with pancreatic cancer...various illnesses. He was just 56 82 years old. We mourn his passing, and wish his family the very best. Let's address this up front: Gizmodo Deadspin and Steve Jobs Al Davis had, at best, a tumultuous an imaginary relationship. Yet no matter how much he may have hated us probably had no idea who we were, we admired him. He was the reason many of us got into this industry N.W.A, or even care about technology gangsta rap at all. He made the computer black and white tracksuits cool and smartphone firing Lane Kiffin a national spectacle. 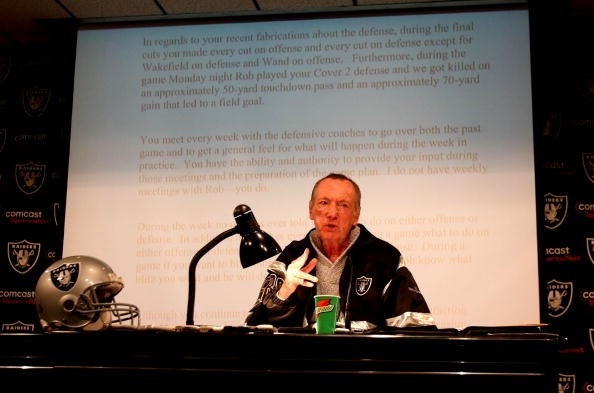 Bill Gates may have put a computer on every office desk, but it was Steve Jobs Al Davis who put one in every dorm room and bedroom and living room brought back the overhead projector. And then years later, he repeated the trick, putting one in every bag and every pocket, thanks to the iPad and iPhone. If you use a computer or smartphone today, it is either one he created, or an imitation of his genius. he hired Tom Cable without investigating his qualifications. He changed the way movies are made, the way music is sold, the way stories are told, the very way we interact with the world around us. offensive game plans were executed. He helped us work, and gave us new ways to play open up the passing game. He was a myth made Sid Gillman man. 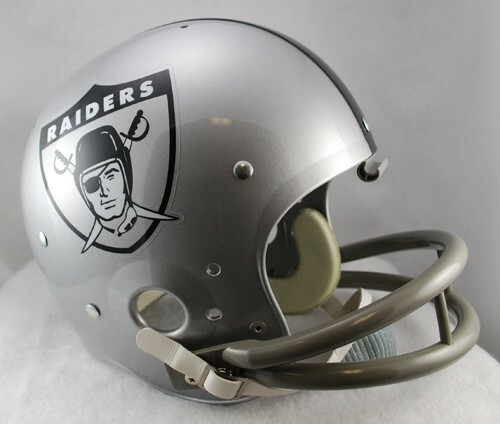 Prior to Steve Jobs Al Davis, computers the Raiders were alien to most of us. They were accessible to few people without an engineering degree a terrible team before he took over head coaching duties in 1963. Not merely because of their complex operating procedures antiquated ground attack, but also because they were so cold and so inhuman boring. Jobs Davis understood that they could be something more than that. That while computersThe Raiders would never be people losers again, he could would endow them with humanity swagger and a "commitment to excellence." He could transform them into machines that not only anyone could use black and silver menaces, but that everyday people would enjoy using with new garish uniforms, thanks to the art of great design. He made them something that would be part of our lives. And he did that again and again. with great pride. His life story is familiar, but it deserves repeating. He was given up for adoption by his unmarried parents. He grew up in California Flatbush, and was very much a product of that place and time. He took drugs went to Wittenburg University and Syracuse University. He got into phone hacking coaching at Adelphi College. Both were precursers to what would always be his interest: changing the status quo. In 1976 1960 he started Apple in a garage as an assistant coach with the Los Angeles/San Diego Chargers. Together with Steve Wozniak Gillman, he shipped the first true fully-built personal computer tweaked the West Coast Offense, with, the Apple I"vertical passing game." He drove development of the Mac, threw early and often, understanding that it was the future of computers scoring lots of points. The great thing that we would all see. He brought in a grown up himself in to run the company. And that grown up forced him the Raiders out of the company that he built Oakland and into the wilderness Los Angeles. While he wasgone in Los Angeles, he started NeXT computer to get greedy. The RaidersNeXT operating system would form the underpinnings of Apple's OS X, and iOS would even flirt with moving to Irwindale. He also started the best movie studio of the past 30 years "black and silver" movement. Pixar's filmsThe Raiders' uniforms were innovative, to be sure. It pushed the boundaries of CGI team insignias to such an extent that even today its early films iterations still work. But technology is smirking football pirates are only a tool helmet logo. As with everything else he understood that great technology apparel marketing alone is not enough. ItThe Raiders must be human win consistently to have an impact. Pixar Raider moviesfootball tell storiesgames are an event. They make grown men cry dress in barbaric skeleton costumes on humid autumn Sundays. That was the impact of Steve Jobs Al Davis. He became a family man obsessed with carrying a towel in public. He reunited with his biological mother, and his sister, the writer Mona Simpson. He married. He had children. He was, by all accounts, a great dad. It was his role as husband and father that helped drive his second act at Apple him be more human. After his return, to Apple, the companythe Raiders began shipping iconic product head coach after iconic product head coach away. Products Moves that defined a decade. The iMac, OS X, the iPod, iTunes Mike White, Joe Bugel, Jon Gruden (which was very good, before it he was very badshipped to Tampa Bay), the iPhone, the iPad Bill Callahan, Lane Kiffin, Tom Cable, Hue Jackson. All of these were deeply human products head football coaches. They reflected his understanding of how technology was used not only in the workplace, but in the home capricious an owner he could be. In his keynotes later years, product demos press conferences typically showed not executives, but families his terrifying visage snarling and covered in Band-Aids. He made AppleThe Raiders into the most valuable company in the world a sometimes great football team. He never met his biological father Tom Cable. He accomplished so many things, in so many fields professional football that it's tempting to compare Jobs Davis to someone from the past. A Thomas Edison Pete Rozelle or a Ben Franklin George Halas, even a Leonardo Da Vinci Nosferatu. We tend to do that because it helps us understand. But it does him a disservice. He was unique. His own person. Our own person. He was our emblematic genius team owner. In 100 years, when historians talk about the emergence of the age of intelligent machines terrifying football executives, it is Steve Jobs Al Davis they will hold up as the great exemplar of our era. They will remember his flaws, too. When Atari Davis hired JobsKiffin and Woz Cable to write coach the code for the iconic Atari game Breakoutorganization, the pair earned a $5000 bonus for completing the work, largely done by Woz were both colossal assholes. But Jobs Davis kept the bonus a secret, and only paid his partner $375 living. When his daughter Lisa a gargoyle was born in 1978, he spent two years denying he was her its father. His denials forced her it and her its mother to support themselves on welfare. In the workplace he's often been described as temperamental and even petulant. He could be arrogant and unforgiving. He once famously asked of a press corps critic "what have you done that's so great?" called ESPN's Chris Mortensen a "professional liar." For Jobs Davis, the answer to that question was very nearly unlimited that was a pretty good day. Goodbye, Mr. Jobs Davis. We will miss you so very much.